But creating a new organization (and educational program) from scratch is a hefty undertaking. Getting the program up and running took nearly three years because it was challenging to recruit supporters at first. The idea of a county-wide leadership program was new and difficult for many people to get behind. “People thought that it would be in direct competition with the Chamber Leadership programs,” Dr. P. says. This meant that funding was also elusive. In response, Dr. P. had to bankroll the fledging organization until she could get other financial supporters on board. 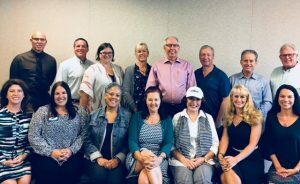 The VCLA board of directors celebrated Dr. P.’s service at the October 2017 board meeting, her last as a board member. From left to right, (Back) Secretary James Mason, Brick Connors, Vice-President Melissa Baffa, Marlene Dean, Dr. Rick Eberst, President Mike Paule, Tom Cohen, and Dr. Steve Elson (Front) Pattie Braga, Cohort XXIII Representative Jennifer Caldwell, Treasurer Sharon Cromartie, Advisory Board Chair Patty Brown, Dr. Priscilla Partridge de Garcia, Dr. Tiffany Morse, and Cohort XXIII Representative Tara Carruth. But she did not give up. Scouring the county and her Rolodex, she recruited an impressive list of leaders from the region who saw the value in what she was proposing and agreed to serve on the founding Steering Committee. These early VCLA leaders represented almost all of the cities across the county. They also represented a great variety of backgrounds. “At that time, the United Way was incubating new nonprofits in the county, such as the Ventura County Community Foundation. The United Way also agreed to support us,” which was instrumental in the new organization’s success. Also important was Coro, a leadership training organization first founded in San Francisco in 1947. According to its website, this program can boast of “at least 10,000 program alumni…currently serving as leaders in local, regional and national/global businesses, non-profit organizations, governmental agencies and elected public office.” Coro helped to provide the structure and curriculum during those all-important formative years. VCLA is currently in its 23rd year, and it left the United Way nest only last year. The decision to stand on its own two feet and seek 501(c)(3) nonprofit status of its own was not made lightly. And although the shelter and support provided by the United Way for more than two decades was incredibly generous and valuable for the organization, VCLA was in an excellent position to strike out on its own, with a well-respected program, a strong reputation, and a deep bench of alumni, many of whom have proven to be the movers and shakers of Ventura County. It is that long list of empowered and successful alumni that Dr. P. is most proud of. These leaders, now numbering just over 500, have helped to improve the quality of life in Ventura County, which is exactly what she had envisioned. “I am most proud of how they work and communicate together,” she says. Wise words from a wise woman. Thank you for everything, Dr. P.! Melissa Baffa serves as the Development Officer in charge of Foundation and Corporate Relations at the Santa Barbara Museum of Natural History. Previously, she worked for other nonprofit organizations in Ventura County, taught middle school science in Simi Valley, California and marine biology in the Upward Bound program based at California Lutheran University, and worked as a research associate at Amgen. 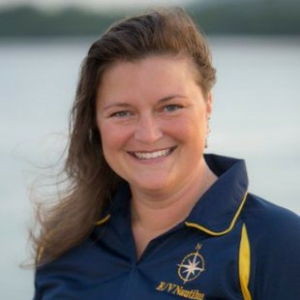 She is a Science Communication Fellow with the Ocean Exploration Trust, having sailed on the E/V Nautilus in 2015 and 2016, exploring the deep sea alongside Dr. Robert Ballard. An avid nature and outdoors enthusiast, Melissa is also active in her community, serving as the current Vice-President of the board of directors of the Ventura County Leadership Academy, on the board of directors of the Ventura County Women’s Political Council, and as the Vice-Chair of the Ventura County Women’s Economic Roundtable. Melissa graduated from California Lutheran University in 1995 with a Bachelor of Science degree in Biology and lives in Ventura with her family. Robyn Daniels on Ahoy Matey!